2) looking at their suitcases and wondering why they brought so much. Packing is hard enough for a vacation in a culture where you are completely comfortable. It gets even more difficult when you go to another country with a culture that is more conservative than you are used to. The stress is understandable. How are you supposed to know what you are going to need? How do you know what is culturally appropriate? Don’t spend more time and energy than you need to on this. We wrote this guide so that you will have all the information available to you in one place! After living in Morocco for over 10 years, we have been able to get a good idea of what is considered modest and what is considered inappropriate. Here are our ideas of what you should wear in Morocco, based off of years of watching dress change with culture as well as the local responses to tourists that come and go. Looking for other packing advice? Read our general packing list here. 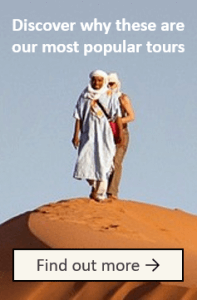 Since Islam is the majority religion in the country of Morocco, people tend to be very modest, though not as conservative as many Islamic nations. 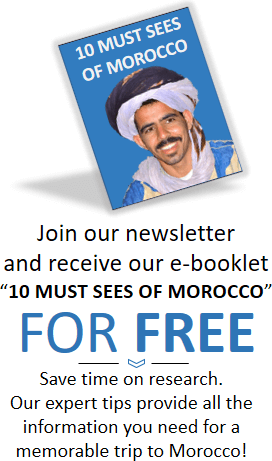 Moroccans are also very kind, hospitable and welcoming of tourists. You won’t be required by any means to conform to these cultural norms or religious ideas of modesty, but we do advise our clients to be respectful of the culture. Moroccans are also very stylish. The way that people dress is influenced by European and Arab style. A note especially to the women: this advice is not meant to be restrictive but to help you fit into your surroundings and avoid hassle as you travel. Female travelers, especially those traveling alone, can receive unwelcome comments from Moroccan men on the street. You’ll find that these comments and attention are much more prevalent when you are dressed in revealing clothing. Most Moroccan women (though culture is changing, especially in the big cities) tend to wear tops with sleeves past their elbows. Tops are also usually long and loose. Many women cover their head or wear their hair back instead of wearing it loose. Younger women tend to dress more “modern” with jeans and long shirts, while older women tend to wear the traditional djellaba and headscarf. Moroccan women do wear makeup, so wearing makeup is not a problem, contrary to what some might tell you. Many tourists will find that they draw more unwanted attention when they are wearing spaghetti straps or clingy tops that are more revealing. Stay away from excessively flashing jewelry, not only to find in culturally, but also to maximize safety. 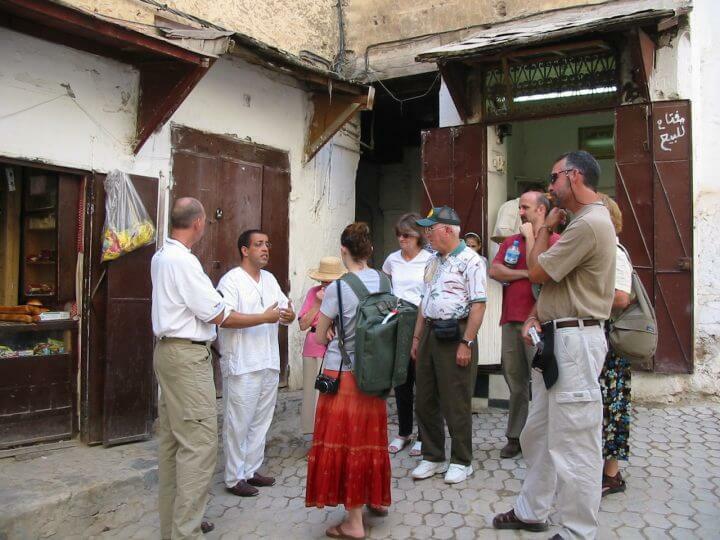 Older men in Morocco will still wear the djellaba, but most younger men are moving towards business casual dress when they are out in public. Most Moroccan adult men won’t be wearing shorts. You might see young men or boys wearing shorts, but as a general rule, long pants are most common. Moroccan men also usually wear collared shirts. Sleeveless T-shirts are not worn, especially in the more rural areas. Men tend to avoid sandals, choosing to usually wear closed toed shoes out of the house. Cultural Guidelines: To feel the most comfortable, you will want tops with at least some sleeves. Moroccan women will usually have their sleeves cover their elbows, but as a tourist, that is not necessary. Stay away from strappy tank tops. If you are wearing pants, you will want a longer shirt. We have seen that Moroccan women tend to wear shirts that cover to their upper thigh when they wear pants, especially if the pants are tighter. You’ll also want to stay away from low cut shirts. Weather Guidelines: Bring clothes that work well with layering! Looser tops are great not only for modesty’s sake but also to protect against the heat. For ordinary days, we advise you to bring looser tops with at least some sleeves. Tunics or button ups are great options. Not only will these protect you in the heat, but they will help you feel more comfortable in your surroundings as you explore. If you are coming in the summer, light cardigans are an ideal item of clothing. Pack a neutral colored cardigan with some sleeves that you can throw on over tank tops. Pack a heavier cardigan for the winter months for stylish warmth! Cultural Guidelines: Pants are definitely acceptable for women in Moroccan culture. You’ll notice the younger generation even wearing skinny jeans! We would advise staying away from shorts. We would aim for the shortest pants to be mid-calf or capri length. If you choose the skirt option, just be aware that most Moroccan women will not be wearing short skirts. Maxi dresses and maxi skirts are a great way to keep cool, but you might want to put a scarf around your shoulders if they are bare for both modesty and the sun. Be sure to pack some comfortable pants that you can use for hiking or camel riding as those activities will be a hassle in a skirt! Weather Guidelines:Pack at least one long light skirt to stay cool, if you are coming in the summer. A skirt will be your coolest option. Flowy pants are another great option. Baggy pants or capri pants will be nice for the summer months. 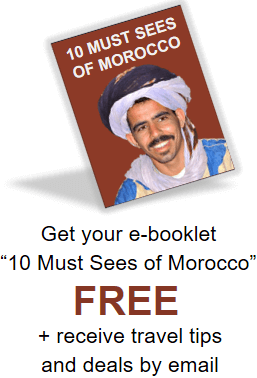 Cultural Guidelines: Moroccan men do dress a little sharper than Westerners tend to. T-shirts are fine, but you might feel as if you fit in a little better if you are wearing a polo or a button up shirt. Moroccan men rarely wear sleeveless shirts. Weather Guidelines: Button-up shirts are a great light option for the heat and to avoid sunburn in the warmer months. Cultural Guidelines: Moroccan men don’t usually wear shorts. However, as tourists, it will be fine for you to wear shorts. If you want to fit in a little better, then you could consider packing long pants. Weather Guidelines: For most of the year, pants won’t be too hot. However, for the summer months or if you are going to the desert, you might want cargo shorts or something of that nature to stay cool. You should definitely bring comfortable walking shoes to wear in Morocco. Most tours involve a lot of walking to see the beautiful sights. Sandals are convenient to keep your feet cool as long as they are sturdy. If you are going to the desert, you will want to have a pair of closed toed shoes available because the sand can burn your feet in the summer. Be aware that many women who pack high heels find they only wore them at dinners or restaurants. 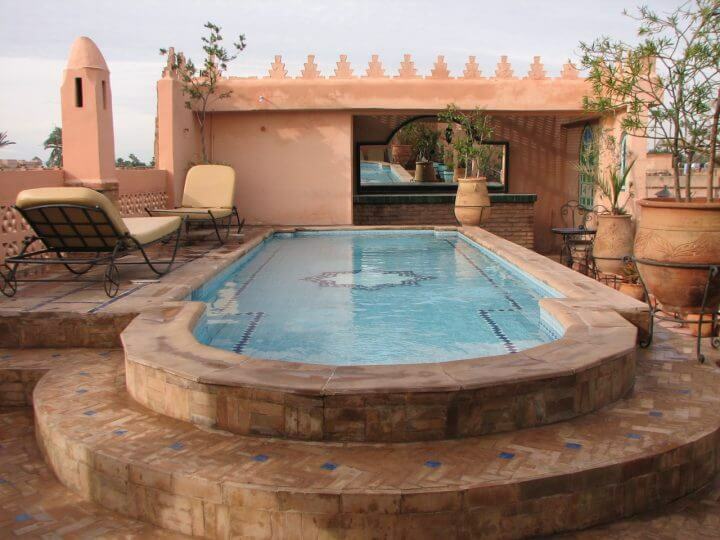 Many hotels and riads have lovely swimming pools for their guest. Since you’ll be mostly swimming inside the hotel, you will probably see a range of swimming suits. We choose to advise on the side of being conservative out of respect, so we advise a one piece or tankini for the women instead of a bikini. In the same way, we advise men to bring swimming shorts instead of a Speedo. Moroccans do tend to dress up more than Americans. You’ll want to bring some more formal clothes, especially for nice dinners at your hotel or riad. Although you still want to respect the Moroccan culture of modesty for these dinners, at a hotel you will be able to be more relaxed since it is a tourist environment. Personally, I would never be thinking about exercising on vacation, but there are those who love exercising wherever they go. If you will be using the gym in the hotel, then most exercise clothes that you are accustomed to wearing in your home country will be fine. If you are planning on running outside, then women should pack pants past the knee with a long loose shirt. The length of the shirt is especially important if you are wearing leggings. It’s not that shorts aren’t allowed, but rather that they will draw a lot of attention. Contrary to popular belief, it can get quite cold in Morocco. We advise bringing a jacket or sweatshirt that you can wear in the evenings or mornings when it is chilly. It especially gets cold in the mountains or in the desert during the night. Make sure you leave some space in your suitcases for things you might purchase while in Morocco. Many visitors love the traditional dress of Morocco and want to bring a djellaba or kaftan back. A djellaba is the loose robe-like garment that Moroccan men and women wear over anything. It usually has a hood and, often hand sewn, decoration on it. A kaftan is the fancier version of a djellaba. It is often worn for celebratory occasions such as weddings or baby naming parties. Kaftans are often bright and sparkly as opposed to the more neutral djellabas. There are also beautiful leather slippers sold in Morocco that can be worn as house shoes or if they are studier, for every day wear. They are sold in any color and many different designs. Check out the handwoven scarves at the weavers as well, especially if you don’t want to purchase something as large as a djellaba or kaftan. Although what you choose to pack depends on you and you have freedom on how conservative you want to be, this guide is a good standard to help you make your decisions. Don’t allow the question of ‘what to wear’ worry you, as Moroccans will not be offended if you follow the basic guidelines of modesty we gave. They are accustomed to tourists and have no doubt experienced a range of different styles of dress. As long as you are considerate by respecting their values, you will be fine! 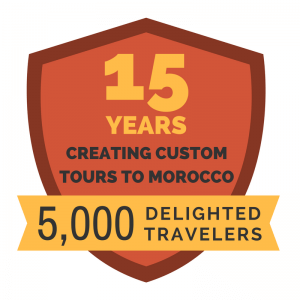 We hope this information helps you enjoy your trip to Morocco to the fullest! More questions about what to wear in Morocco? Contact us.